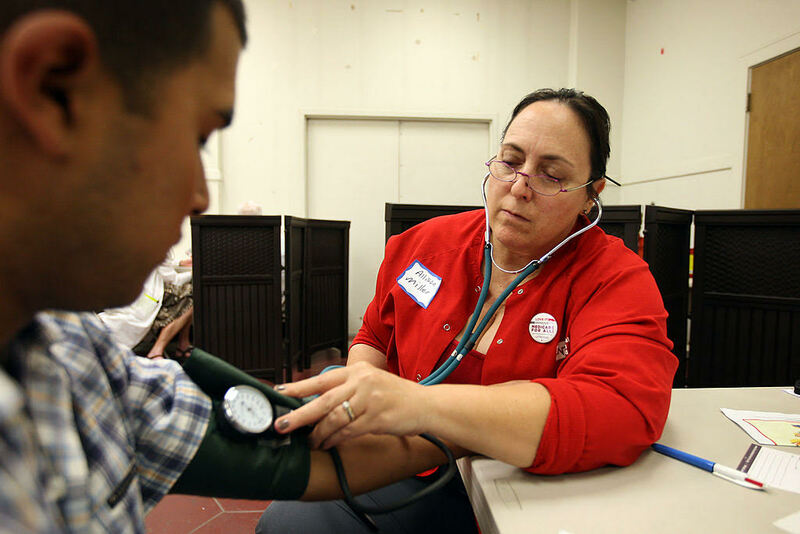 Los Angeles County’s nonprofit community clinics and health centers have expanded care significantly for the county's underserved in the wake of the Affordable Care Act (ACA). Now, with Congress debating the future of health care, the only sure thing is uncertainty. The growth of Los Angeles’ safety net has been dramatic: Clinics went from serving 1.2 million patients in 2010 to 1.5 million in 2015, and expanded from 300 to 350 full time sites. The majority of patients in L.A.’s clinics went from being uninsured (53 percent) to insured under Medicaid, the program serving low-income families, (57 percent) during that same period. Antelope Valley in northern Los Angeles County has experienced some of the most dramatic growth. Clinics in the Antelope Valley went from serving 2,842 patients in 2007 to 41,164 in 2015. They increased their medical, dental, and mental health providers from two full-time positions to 105. Despite this expansion, the Los Angeles Dept. of Public Health found that in 2015 the Antelope Valley fared worse than other areas in the county in key health outcomes. In the valley, 29.6 percent of adults are obese, 13.9 percent have been diagnosed with diabetes, and 30.3 percent are diagnosed with hypertension. Such high rates of chronic disease have prompted clinics to try new approaches. In Lancaster, the Bartz-Altadonna Community Health Center now hosts an in-house food pantry staffed by a nutritionist. The nutritionist also provides advice on how to make healthier meals, allowing these patients to control their chronic conditions. She conducts individual and group visits for patients with diabetes and with high blood pressure. The center has seen a 200 percent improvement in the blood sugar management of diabetic patients. South Los Angeles has undergone a similar transformation. Clinics in South L.A. went from serving from 82,369 patients in 2007 to 267,171 in 2015. Meanwhile, they tripled their number of medical, dental, and mental health providers. While South L.A. may not be as isolated as the Antelope Valley, its residents face major health challenges, around one third of the population is obese, 12 percent have been diagnosed with diabetes, and 17 percent are at risk of major depression. The great need for care has left clinics scrambling to hire the staff they need and pushed them to find new ways to increase the pipeline of candidates, while retaining current workers. For example, this summer Altamed, UMMA Community Clinic and South Central Family Health Center will host students from Escuela Latinoamericana de Medicina, the medical school in Havana, Cuba. Over the course of four weeks, four American medical students studying at the school will shadow physicians as well as contribute to the clinic by completing projects in quality improvement, optimizing data, patient engagement, and patient health education. The Los Angeles clinics hope to recruit these students once they graduate. In a similar program, clinics are working with LA Trade Tech to expose their nursing and pre-nursing students to career opportunities in clinics through job shadowing and other events. Clinics are also testing models that move their payment systems to reward quality of care rather than today’s system of paying more based on the volume of services delivered. The two major payers for L.A.’s clinics are Medi-Cal, California’s Medicaid program (48 percent of revenue), and My Health LA (5 percent). Historically, these programs were built around a fee-for-visit model, in which the clinic receives payment only if there is a one-on-one visit between a provider and patient. Other needed services that keep patients healthy, such as group visits, case management and using promotoras, or lay health workers from the community, to conduct outreach, are not billable under this payment model. In 2015, LA County changed how care could be reimbursed. Clinics participating in the My Health LA program, which serves undocumented residents, receive a monthly amount for each patient who chooses them as their home clinic. The clinic must demonstrate that patients get their routine needs met, but they do not need to record a visit in order to receive a reimbursement. In the coming year, five LA clinics will be testing out a similar approach to payments under a pilot Medi-Cal program. With the commitment by the GOP leadership to repeal the Affordable Care Act, clinics have had to reassess whether the expansions they’ve made and the innovations they are pursuing can be continued. In LA County, 1.5 million residents received coverage through the Medicaid expansion or Covered California. Current bills in the House and Senate would roll back the Medicaid expansion and significantly change the way the program is financed. Clinics could return to seeing a majority uninsured, as in the past.